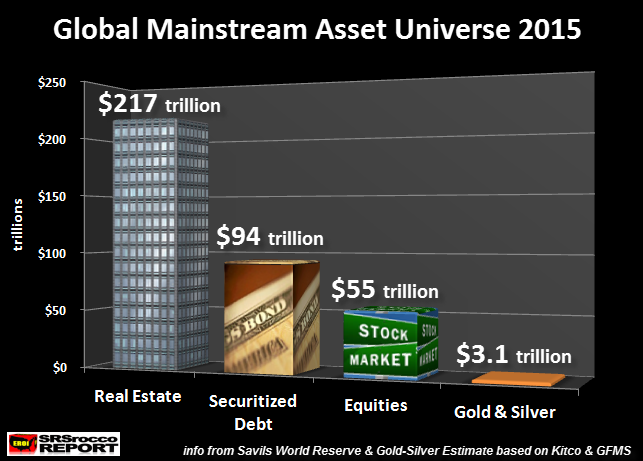 The world doesn’t realize it yet, but the implosion of the global markets has started and can’t be stopped. While the financial networks continue to focus on the rising U.S. stock market and Dollar, this represents a mindset that has totally gone insane. Why? Because the rapidly increasing Dollar and broader U.S. stock market do not represent a healthy economy, rather it reveals the swelling of the cancerous U.S. financial tumor. 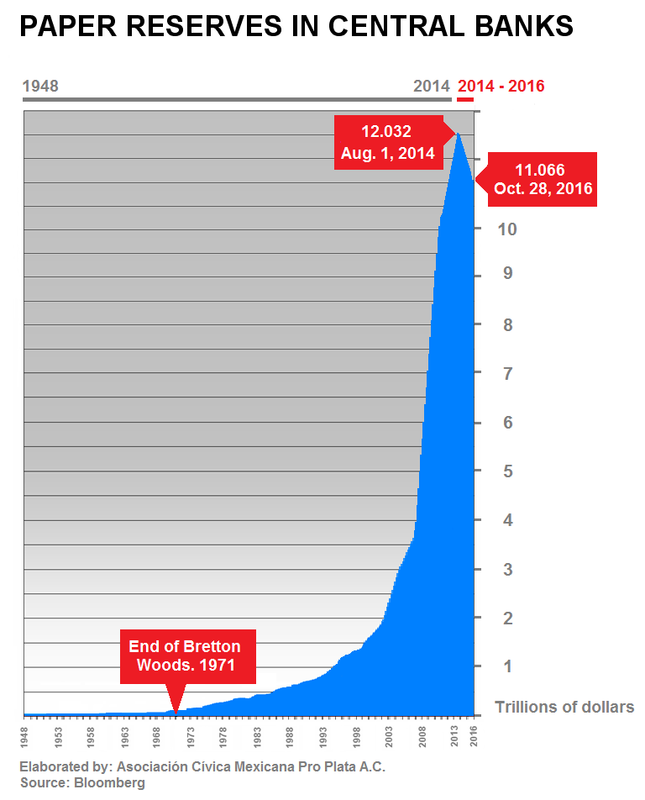 The faster and larger it grows, the more it will endanger the U.S. economy. I am completely surprised by the lack of wisdom in the Mainstream and Alternative media analyst community. While many Mainstream analysts are probably paid to put out positive financial or economic propaganda, a good portion of the alternative media has no clue about the key factor that is driving the world straight over the cliff. Furthermore, many precious metals investors are throwing in the towel and getting into the greatest overvalued stock market frenzy in history. Fortunately, those who read the SRSrocco Report articles, especially on energy, understand there are only a few ideal future investments worth owning… so they BUY & HOLD their physical gold and silver. Unfortunately, President Elect Donald Trump will not be able to turn the mighty U.S.A. Titanic away from hitting the massive DEBT ICEBERG below. It’s just a matter of time. 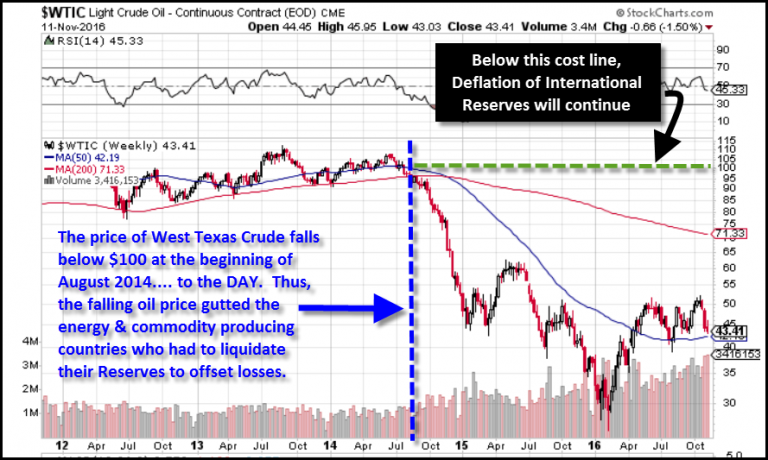 As I stated in my article, The Peak & Decline Of International Reserves Warns Of Massive Asset Deflation Ahead, the global economy has already hit the wall and is now imploding. While this may be slow at first, it will pick up speed over the next several years. You see, the net sell-off of U.S. Treasury paper signifies the beginning stages of the global market disintegration. Furthermore, there is more evidence of this if we look at the economic data provided by the World Bank. 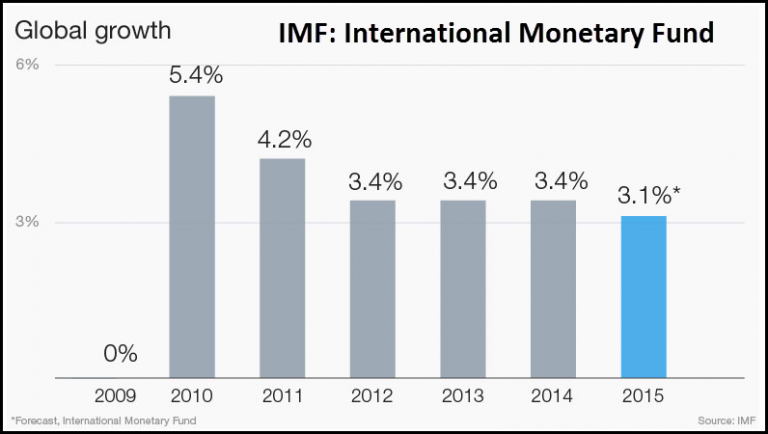 Something fishy seems to be going on at the IMF as their Global GDP figures are much higher than the World Bank’s figures. 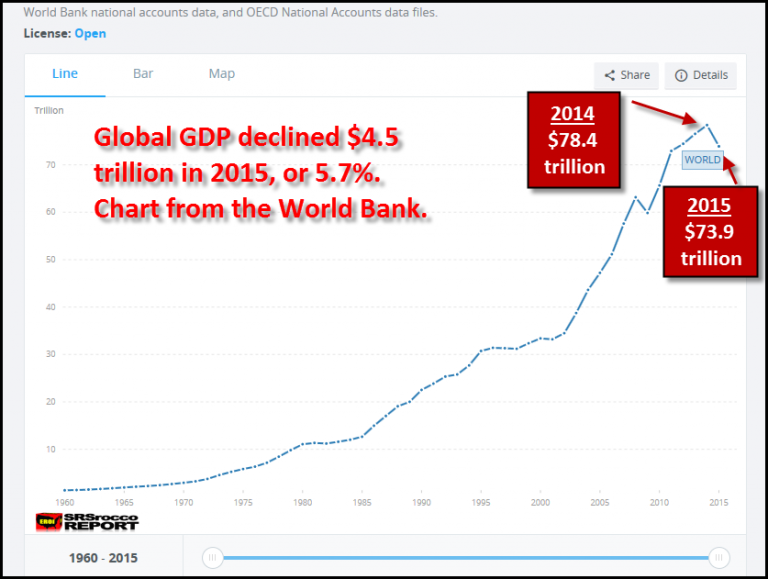 I have more confidence in the World Bank’s GDP Growth rate of a negative 5.7% for 2015, because the price of Brent Crude oil collapsed 47% in 2015 versus 2014. This had a profound impact on the global economic growth. For those who believe energy has nothing to do with economic growth, you may consider getting a MRI or CATSCAN, as BRAIN DAMAGE is the likely culprit. Again, the U.S. and global markets are in BIG TROUBLE while the majority of investors continue to pull the trigger on the RUSSIAN ROULETTE GUN. Of course, there maybe a few more empty chambers before the gun goes BANG, but I can guarantee that it will finally go off. And when it does, investors will finally realize how completely INSANE they were to play in a market that was totally rigged. I will continue to receive comments and emails from some readers who like to criticize the precious metals analysts for being so wrong on the gold and silver paper price forecasts. To tell you the truth, this does not bother me one bit. I am used to it. This type of individual is not grounded in the dire energy predicament that the world is facing and is also conveniently ignoring the greatest Central Bank monetary manipulation in history. I call it this type of mental activity, BRAIN DAMAGE. As the disintegration of the U.S. and global financial markets pick up speed, patient precious metals investors will finally see the light at the end of the tunnel.